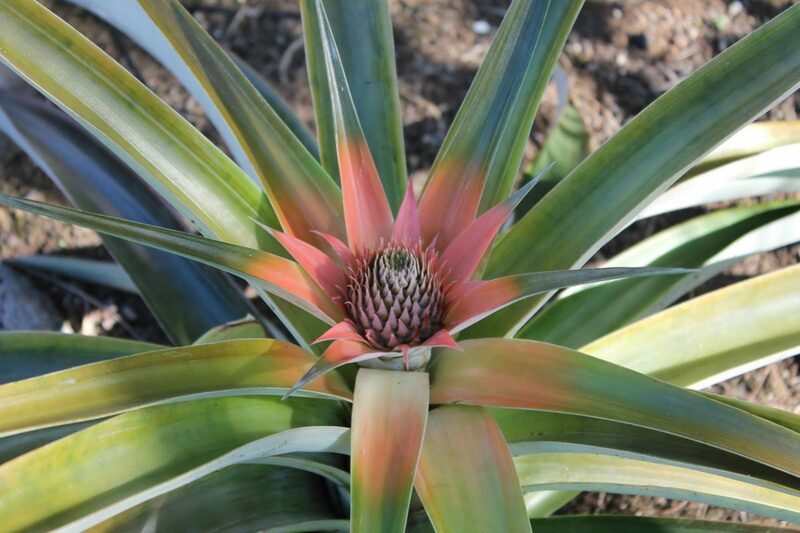 Have you been waiting for updated pineapple plant pictures? Am I the only one completely fascinated with this pineapple plant growth? It can’t be… it just can’t be! 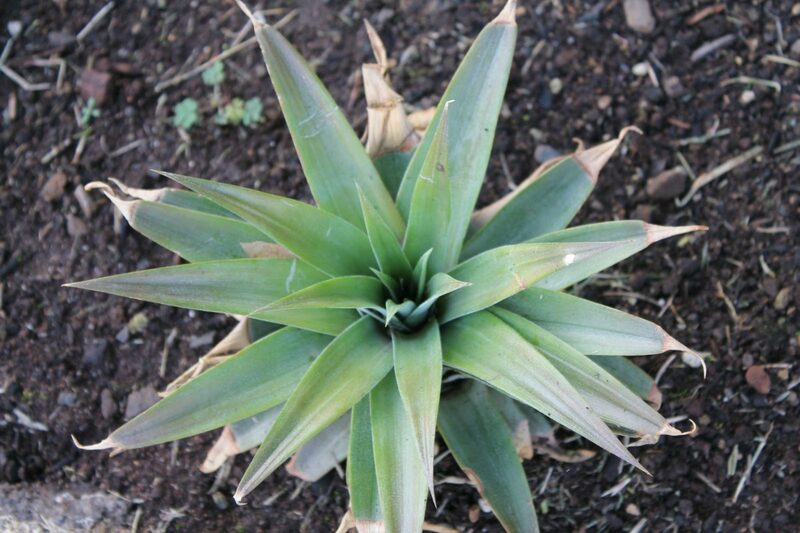 Joking aside, we planted the top of a Maui Gold pineapple (from Costco) in our flower bed in January 2012. It was an experiment, to see if we could really do it. Here’s what it looked like in February 2012 with some new growth in the center. A year later (end of January) it developed a red bud. And yes, I’ve been checking on it every day since… you can’t take the farm out of the farm girl, it would appear. Here’s what it looks like today! I love how the leaves around the bud have turned a beautiful pink! The plant is now 2 feet tall and four feet in diameter. What’s your favorite local coffee? Are you a coffee drinker? What kind of coffee do you drink when you go on vacation? Do you stick with what you know, bringing your own can of Timmy’s coffee? Or do you experiment? Generally, I like to stick with what I know… but when we moved to Maui, I couldn’t get my ‘usual’ coffee anymore (and no, it wasn’t Tim Hortons coffee)… So we’ve been trying our way through different coffees, and I’ve discovered that my former ‘usual’ wasn’t that great! I’ve also discovered that I prefer to grind my beans every morning. We’ve added coffee grinders to all our condos last year so you too can grind your coffee if you like. 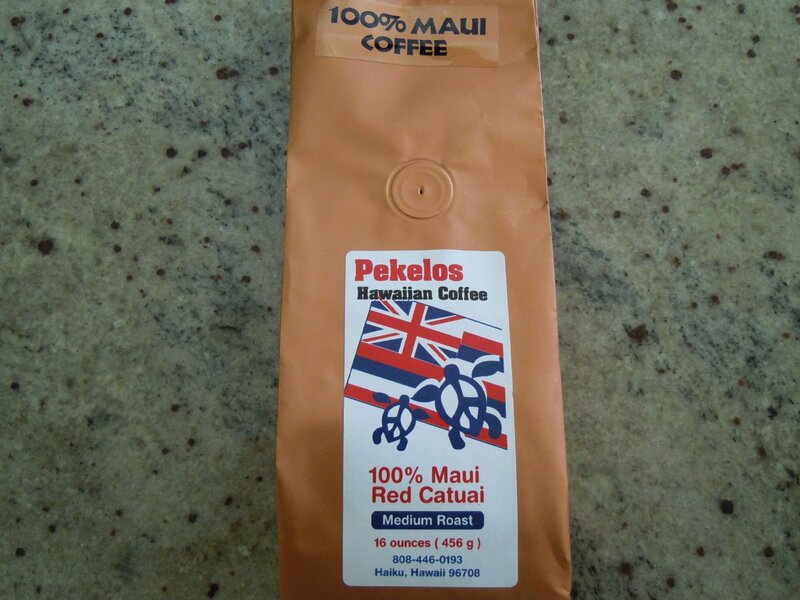 We are currently drinking Pekelos Hawaiian Coffee’s 100% Maui Red Catuai medium roast. There was a friendly gentleman from the Hawaii Coffee Association at the farmer’s market at Queen Kaahumanu Mall this week, selling a variety of beans. This one is quite lovely. The beans are grown on West Maui and Upcountry Mountains and sold by the Vineyard Food Company Catering. 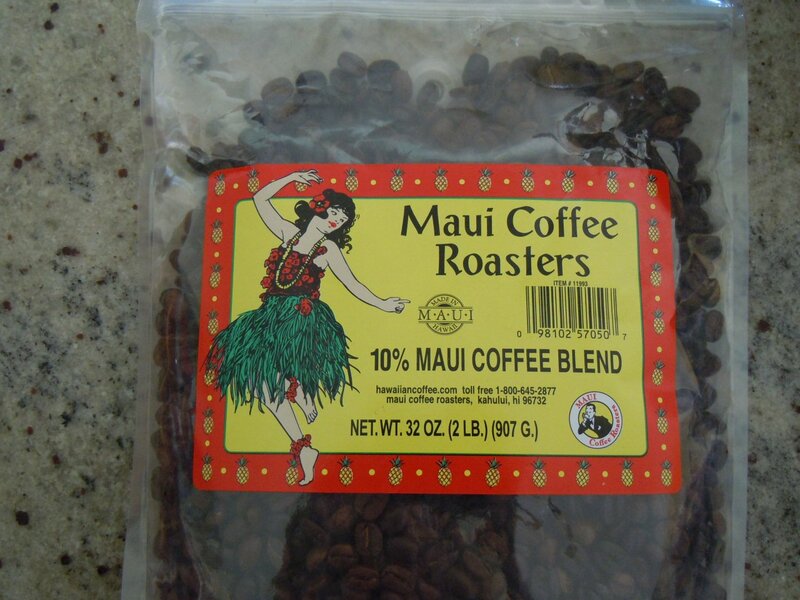 This is the coffee we usually drink – the 10% Maui Coffee Blend from Maui Coffee Roasters. We buy a 2 lb bag at Costco for under $18 (you’ll find it next to the Starbucks and Kirkland brands). Of course, I realize it’s just 10% Maui coffee. Maui Coffee Roasters have a store in Kahului, close to the airport. Go have a look, try some of their 100% Maui coffees and see which of their coffees is your favorite. 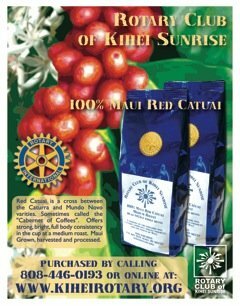 Another coffee we’ve enjoyed several times is the Kihei Sunrise Rotary Club’s 100% Maui Red Catuai roast. It’s a fundraiser for the local Rotary Club, and yes, you can order it online, or arrange to pick it up here in Kihei. If you’ve stayed at one of our condos since this past September, you will have found a small one-pot packet of Coffees of Hawaii whole coffee beans for your first pot (those coffee grinders in our condos will come in handy) or to take home with you. 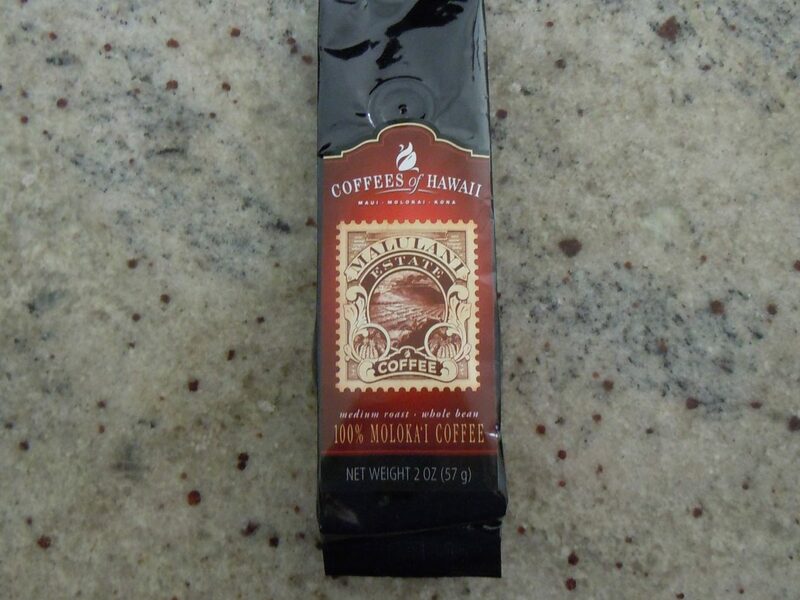 This coffee is grown on Molokai. You can buy more online, or pick some up at Hilo Hattie’s. Here is another coffee that I’ve had tucked away in my closet for a while, saving it for a special occasion. I know, you coffee connoisseurs out there probably would say it’s ruined as it’s been sitting so long. I’m sure it will still be fine for my non-gourmet taste buds. Keokea Farms won 2nd place for the Maui district at the Hawaiian State Cupping Competition this past July with this roast. 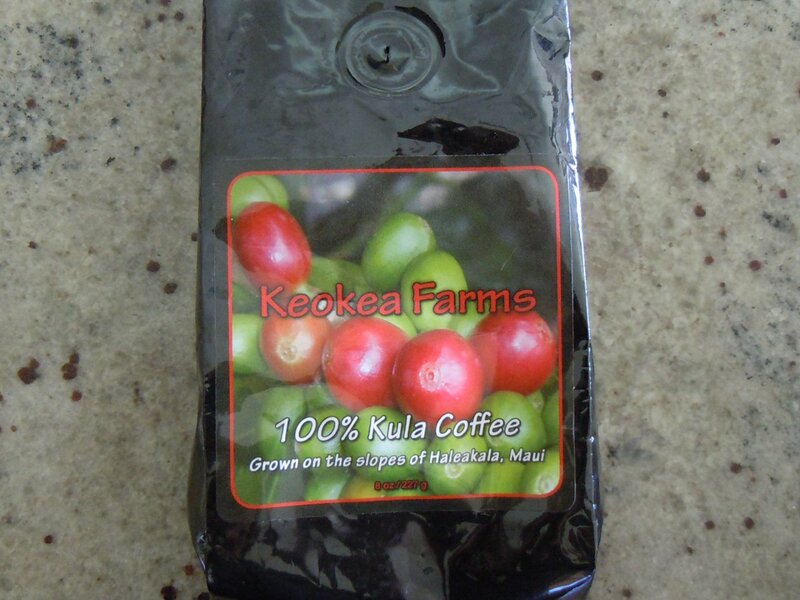 It is grown in Kula, upcountry Maui. So how about it? Which coffee will you try when you come to Maui? Let me know which new favorites you find! Our neighbors invited us to join them in the unearthing of a hawksbill turtle nest this afternoon. The hawksbill turtles are on the critically endangered animal list. 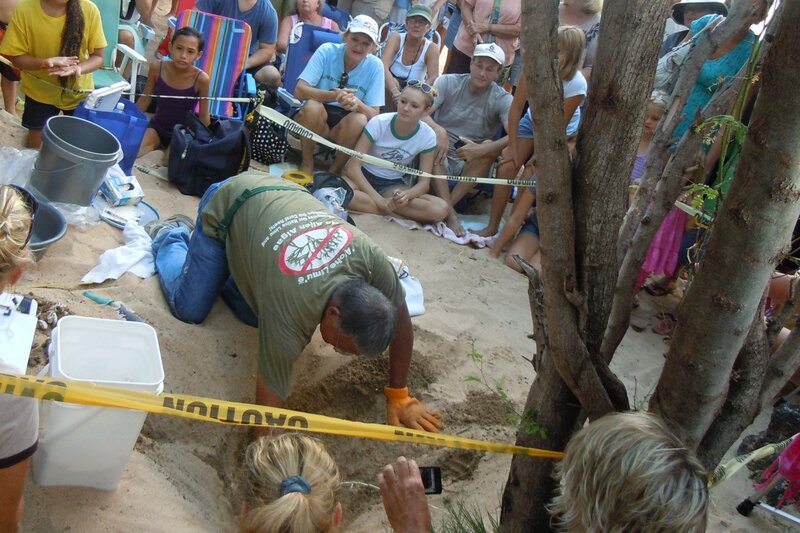 During nesting season, volunteers comb the beaches, looking for turtle tracks that would indicate nesting. Once a nest is found, it is staked, and watched (I’m not sure on the details). Then when the turtles are due to hatch (after about 2 months), volunteers camp out by the nest, through their presence scaring away predators… This particular turtle nest on Oneloa beach (Big Beach) had hatched a number of turtles a few days ago. 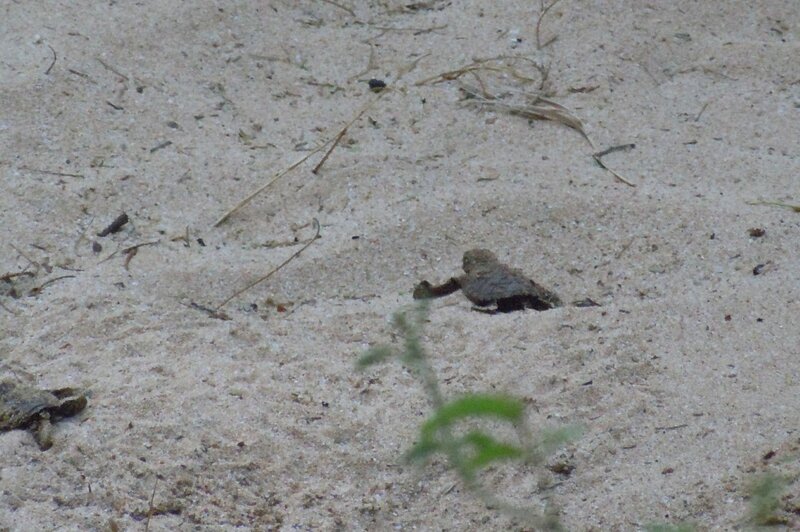 This afternoon they unearthed the nest, checking for any other live turtles. They found egg shells, dead turtles and 6 live turtles. Once everything was recorded, they took the baby turtles to the beach where they slowly crawled towards the water, eventually being swept away by one of Big Beach’s giant waves. It truly was the coolest thing to see. Reminded me of a kids movie (Turtle Tale?) I recently watched – and yet, not. 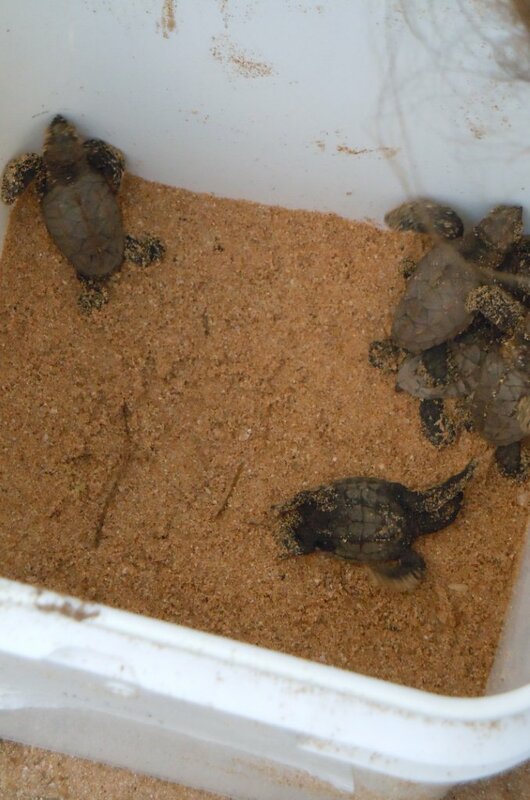 the live turtles waiting for their release into the Pacific Ocean. Safe swimming, little guys! 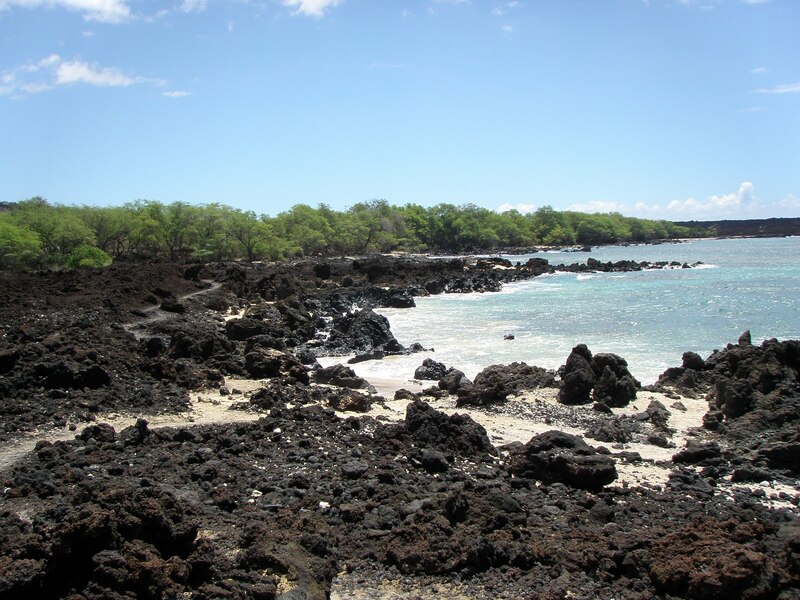 La Perouse Bay, known to our family as ‘the old lava flow’, is definitely worth checking out! As you may know, Maui was formed by two volcanos – the now extinct Mauna Kahalawai (West Maui Mountains) and Haleakala, which you will find labelled as both active and dormant. I’m not sure how a volcano can be active and dormant at the same time, but there you have it. You take the main road through Wailea and just follow it to the very end. You drive through Makena and through wilderness and brush, along the ocean, past beautiful mansions… the road will get narrower and narrower and you will probably think to yourself, ‘I must have missed it’. No – keep going! When you are almost there, you will be surrounded by broken up chunks of lava on either side of the one lane road. Once through that, you pass a ranch on the left and the road ends with a parking lot on the right next to the ocean. I encourage you to get out of the car and hike around in the old lava field next to the parking lot. It is really cool, and it is free! Some say this last lava flow occurred in 1790, but according to Andrew Doughty’s ‘Maui Revealed – the Ultimate Guide book’ (5th edition, page 135), it could have occurred 300 years prior to that in 1490 also. Incidentally, this is a great guide book, I highly recommend it – look for it on Amazon, your friendly neighborhood ABC store and even Costco! Truthfully, I’m intimidated! I’ve been reading well-written blogs (okay, and some not-so-well-written blogs) for years now…. and here I am, writing my first blog! About life and things to do on Maui! I hope you enjoy it! Yesterday was the first day back to school! Our family likes to celebrate all events, big and small, and our favorite way to celebrate is to buy tasty malasadas! Malasadas are Hawaiian donuts, made fresh while you wait! According to Wikipedia, it was Portuguese labourers who introduced them to Hawaii in the 1870s. We buy them at the Homemaid Cafe in Azeka Shopping Center (South Kihei Road in Kihei). They do only make (and sell) them before 10am, and yes, every now and then they run out before 10, so if you can, get there early! Homemaid Cafe serves two versions – plain sprinkled with sugar or custard-filled. And they are delicious! My favorite are the custard-filled! Definitely plan to get more than one per person! 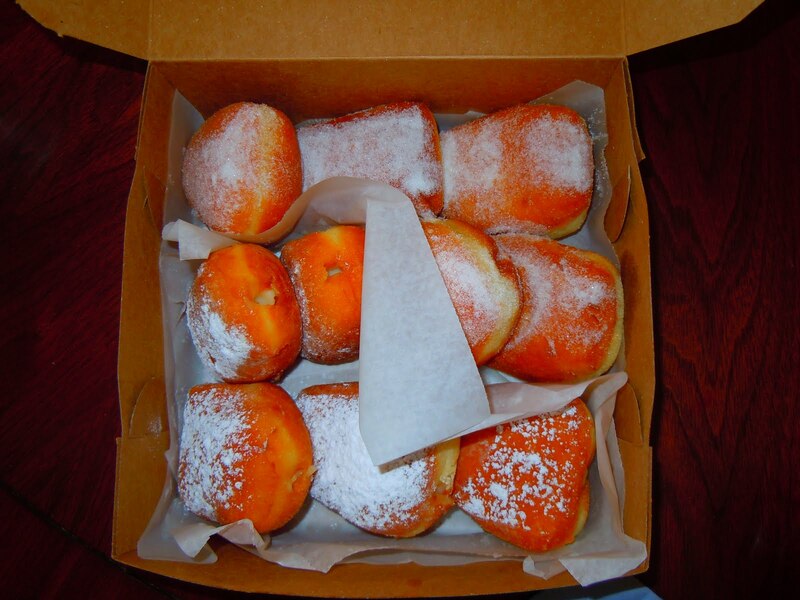 a box of delicious Hawaiian goodness – five ‘plain with sugar’ malasadas at the top, five ‘custard-filled’ on the bottom.